EGYPT: Enforced disappearance and medical negligence lead the violations race in Egypt during September and October. The continued disappearance of former Egyptian parliamentarian Mustafa Al-Najjar raises doubts about his fate. 232 violations were monitored during September, and 499 more in October, where Sharqiya governorate took the lead in such suffering. Prisons preceded police stations and “National Security” in violations count, where officers of the later were the most notable perpetrators of documented violations. 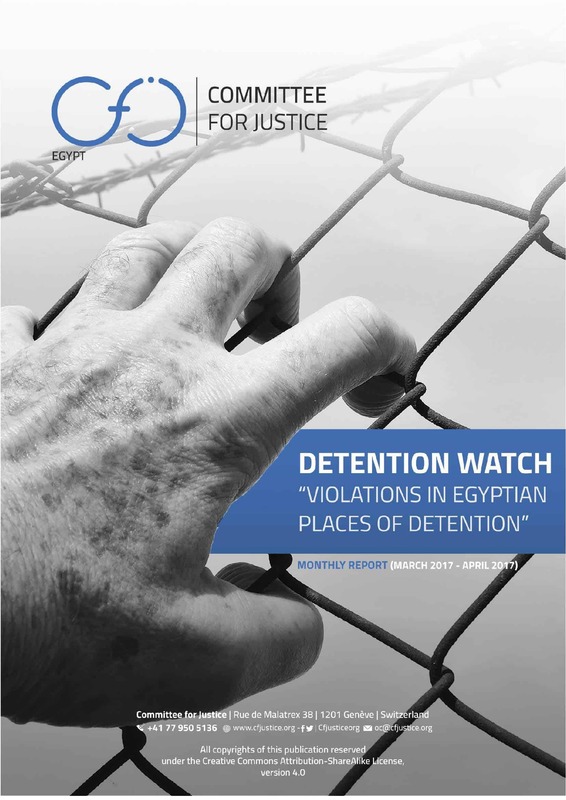 Committee for Justice publishes its periodic report on the status of human rights in the Egyptian places of detention – formal and informal – covering the months of September and October 2018; in parallel with continued disappearance of former parliamentarian Mostafa Al-Najjar amid widespread doubts about his fate, according to his family, while Egyptian authorities insist that “he is not present in any Egyptian prison” as per a statement by the assistant Minister of Interior for prisons sector, Major General Zakaria Al-Ghamr. 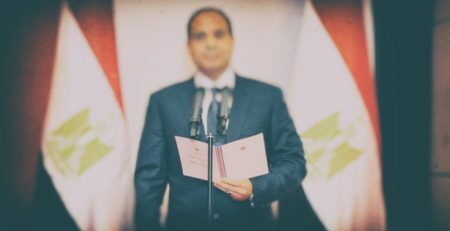 This raises deep concerns about the persistence of the crime of enforced disappearance in Egypt, with no formal acknowledgment of what has been documented and still remains, as presented in this report. 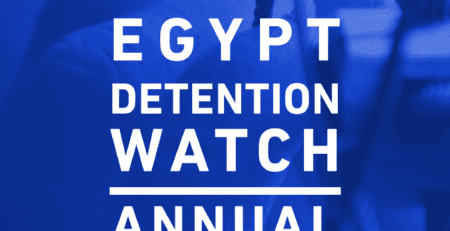 This report comes within the ‘Detention Watch Project’ which has monitored and documented a large number of human rights violations against detainees in Egyptian places of detention for the entirety of months in 2017 and 2018; holding the Egyptian authorities fully accountable for their obligations mandated by law including Egyptian constitution, Egyptian criminal law, and international human rights treaties Egypt has signed. 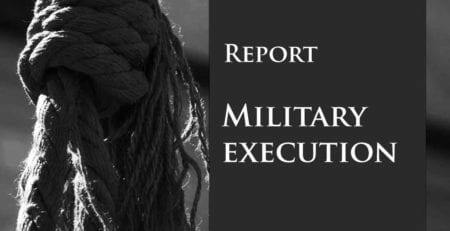 The report aims to: inform national and international stakeholders of the ongoing conditions inside places of detention, enable families of victims and detainees to factually establish claims of illegal and inhumane circumstances that are endured, engage or demand engagement of authorities into a dialogue that can formulate coherent and consistent strategies and legislations that put an end to such violations, support prevention of impunity of human rights violations in places of detention, and to contribute to the transitional justice mechanisms that this country will or might employ at a later stage. The methodology of this activity primarily entailed monitoring and observing violations being reported formally and informally on a daily basis. 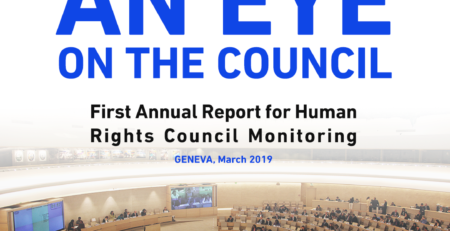 After collecting the primary data, the project team employed the verification tool; a step that is regrettably overlooked by many other human rights organizations reporting in the same field due to difficulties in establishing contact, time consumption and risks associated. Authenticating the data collected comes as a pivotal step for “Committee for Justice” to safeguard the credibility of the data presented, and to be able to legally hold the violators accountable with proof. Accordingly, it was imperative for Detention Watch to communicate with the families of each detainee who suffered a violation and verify all the information needed. All the gathered data whether monitored or verified were finally compiled in this report with a contextual and statistical analysis; while shedding light on the challenges and limitations handled while working on the material. According to the project team, 232 incidents of violations in places of detention were monitored in September 2018, while in October 2018, the number rose to 499 monitored violation incidents. The crime of enforced disappearance was the leading violation in September. CFJ monitored a total of 113 cases in September 2018 (48.7% of total monitored violations in the month), As for the month of October 2018, medical negligence was the most frequent violation observed, where 179 cases were monitored (35.8% of total monitored cases in October 2018). According to data verified, we found that 56 detainees out of the 64 had been subjected to enforced disappearance (87.5% of all verified detainees cases), where enforced disappearance periods ranged from 1 week to 1 month (26.7% of verified enforced disappearance cases), 1 to 3 months (41%), 3 to 6 months (18% of verified cases), less than a week (17.8%) and cases of an enforced disappearance lasting for more than six months (at 5.3%). Documentation showed that locations where detainees were held during their enforced disappearances included 12 different State Security Premises across Egypt, four police stations, a Security Forces Camp, a Security Directorate, and an Army Battalion. For 20 detainees, during their enforced disappearance period in State Security Premises and police stations, they were tortured as well. CFJ also documented 21 cases of medical negligence in places of detention in September and October 2018. The Scorpion Prison had the highest number of cases with 5 cases documented. Beside another 8 prisons, there were also Minya Al-Qamh Police Station and Azbakia Police Station that had documented cases of medical negligence. Verified data also revealed that 62% of those 21 detainees were not offered an examination, or were given an insufficient examination which was performed by an unqualified medical practitioner, 83% of them were not given a diagnosis, while none of them were given the medicine or surgery they needed. CFJ team verified 70 violation incidents committed against 64 detainees that took place in 28 known places of detention across Egypt. In term of locations where violations took place, prisons category represented the biggest category (with 18 detainees), followed by police stations (with 15 detainees). In addition, there were eight detainees who suffered violations in State Security Premises, another two in Security Forces Camps and one in a Security Directorate. These numbers were concluded after excluding cases in which the detention place was unknown due to the detainee being under enforced disappearance. According to verified data, places of detention where violations took place were mostly in Sharqia and Alexandria governorates. Sharqia governorate’s high record is due to the high number of violations that took place in police stations across the governorate in the period covered by this report. As for arbitrary detention, CFJ team documented 18 cases of arbitrary detention in September and October2018. Our team believes that what those 18 cases lie under category 2 (arrest and detention due to the practice of legitimate rights such as protesting and freedom of expression) and category 3 (severe violations to the principles of fair trial) of the categories of the Working Group on Arbitrary Detention. Monitored data show that most of detainees who suffered from arbitrary detention are currently imprisoned in police stations or Prisons, while CFJ verified that 17 detainees out of 18 suffering from arbitrary detention are currently held in pre-trial detention. 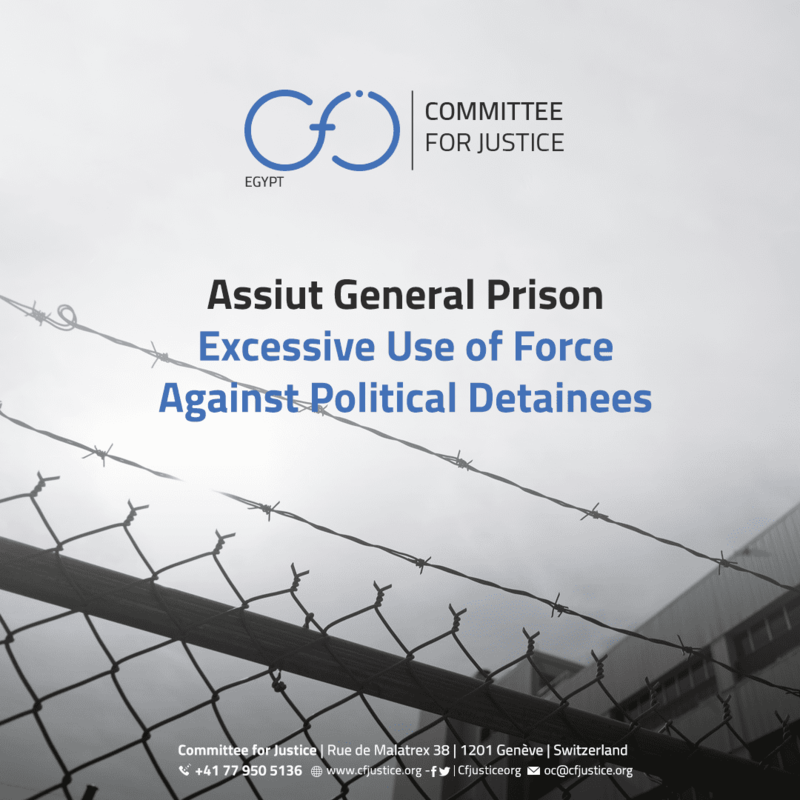 looking over all documented information of 64 detainees since their arrest, CFJ found that 20 out of the 64 detainees were tortured following their arrest while 33 detainees are yet to be allowed visits, and thus it is unknown if they suffered from torture. CFJ verified that 20 detainees were tortured in 16 different places of detention following their arrest, mostly in State Security Premises. Regardless of the place of detention, the majority (15 of 20 incidents) of torture incidents were committed by State Security Agents. Most detainees who suffered violations are still in pre-trial detention with only 8 serving a sentence after their trial was concluded. Out of 232 cases of violations monitored in September 2018, a total of 113 cases of enforced disappearance were monitored (48.7% of monitored violations). Arbitrary detention was the second most frequent violation with 69 incidents monitored (29.7% of monitored violations). Then, came medical negligence with 33 cases (14.2%), death in custody with 10 cases (4.3%) and torture with 7 cases (3.01 %). In September 2018, CFJ monitored 69 incidents of arbitrary detention, which included 5 women, 2 lawyers, in addition to a former parliamentarian and 11 students. CFJ also monitored the enforced disappearance of 13 students, 3 lawyers, 6 women and 2 journalists. Sharqia governorate had the highest number of monitored arbitrary detention incidents in September 2018, with 31 cases representing 45% of total monitored arbitrary detention cases. 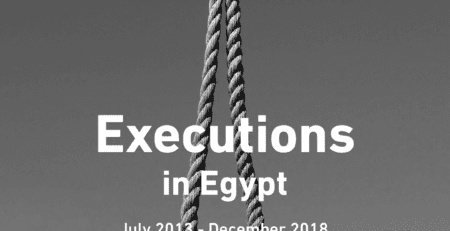 CFJ monitored 4 extrajudicial killings in September 2018, 4 deaths due to medical negligence in different places of detention across Egypt, 2 deaths due to unspecified reasons, and 3 deaths in custody which took place in police stations. 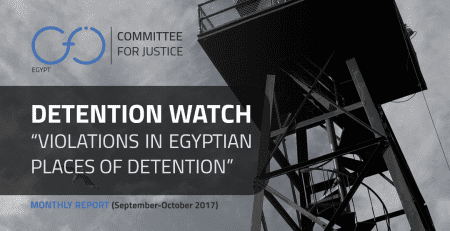 CFJ monitored 33 medical negligence incidents, and 7 incidents of torture in places of detention across Egypt in September 2018. Notably, all torture incidences took place in prison, 4 of which occurring in Minya Maximum Security Prison. In October 2018, a total of 179 cases of detainees who were subjected to medical negligence was monitored (35.8% of monitored violations in October 2018). Arbitrary detention were the second most frequent violation with 138 monitored incidents at 27.6% of total monitored cases. Enforced disappearance was the third most frequent violation with 71 incidents monitored amounting to 14.2% of the total detainees, followed by extrajudicial killings and death in custody with 52 monitored incidents (11.8%) and torture with 52 monitored incidents (10.4%). Sharqia Governorate had the highest number of enforced disappearances with 26 monitored arrests and disappearances (36.6%), more than double the numbers of Giza governorate which followed with 11 monitored cases at 15.4%. In the same month, CFJ monitored 138 incidents of arbitrary detention, 4 of which were against women. Arbitrary detention also took place against two students, a former parliamentarian, four lawyers and two journalists. 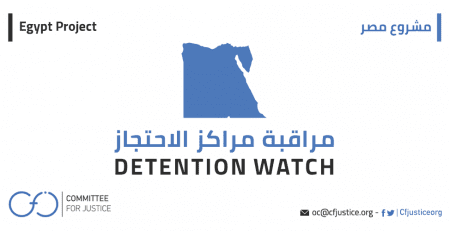 Sharqia governorate had the highest number of arbitrary detentions monitored – for the second consecutive month – with 53 cases at 39.4% of total monitored cases. CFJ monitored 52 extrajudicial killing incidents, 33 of which took place in Assiut while 19 occurred in North Sinai. 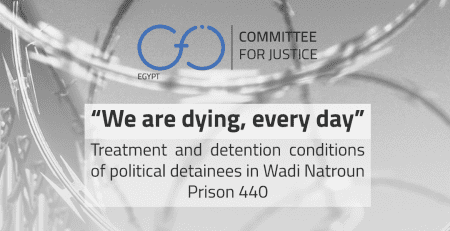 Our team also monitored 6 deaths in places of detention due to medical negligence, where one of the deaths took place in Borg Al-Arab prison, another one occurred in Wadi El-Natroun Prison, while the remaining 4 deaths took place in police stations across Egypt. CFJ team monitored 52 incidents of physical torture, 39 of which took place in prisons, while five students, 5 women and 6 lawyers suffered enforced disappearances. CFJ also monitored 7 incidents of solitary confinement that took place in Zagzig General Prison.